N.H.M. 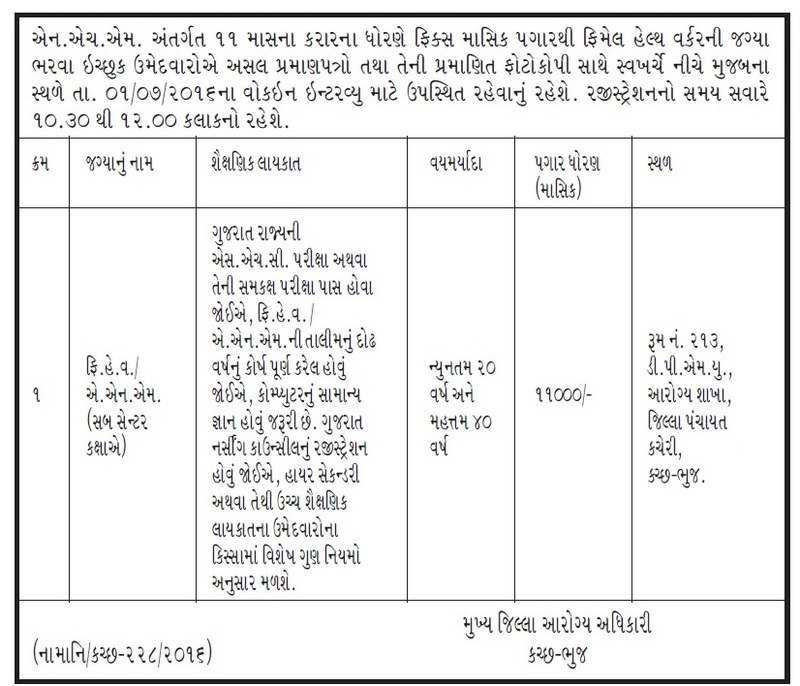 Kutch Bhuj has published a Advertisement for below mentioned Posts 2016. Other details like age limit, educational qualification, selection process, application fee and how to apply are given below. Posts : Female Health Worker /A.N.M. Educational Qualification : H.S.C. or equivalent exam passed. F.H.W./A.N.M. Course of 1.5 years , Computer knowledge, having registration in Gujarat Nursing Council. Age Limit : Between 20 to 40 years. Venue : Room No. 213, D.P.M.U. Health Department, District Panchayat Office, Kutch - Bhuj. Registration Time : 10:30 to 12:00 p.m.